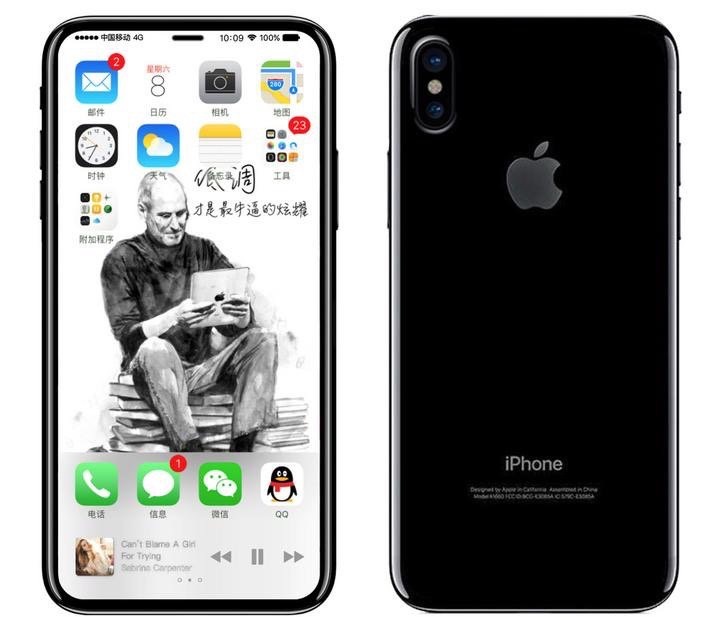 Days after a claimed 3D design drawing of the upcoming "iPhone 8" appeared, frequent Weibo leaker KK has shared a different dimensional drawing and renderings showing a device that is somewhat smaller in size than the previous leak. The veracity of the new drawing can not be confirmed, but KK has on several occasions shared accurate details about previous devices. This new iPhone 8 leak shows a device that measures 137.54 mm tall by 67.54 mm wide, nearly identical to the iPhone 7's 138.3 mm x 67.1 mm body. The thickness of the iPhone 8 is not shown on the drawing. 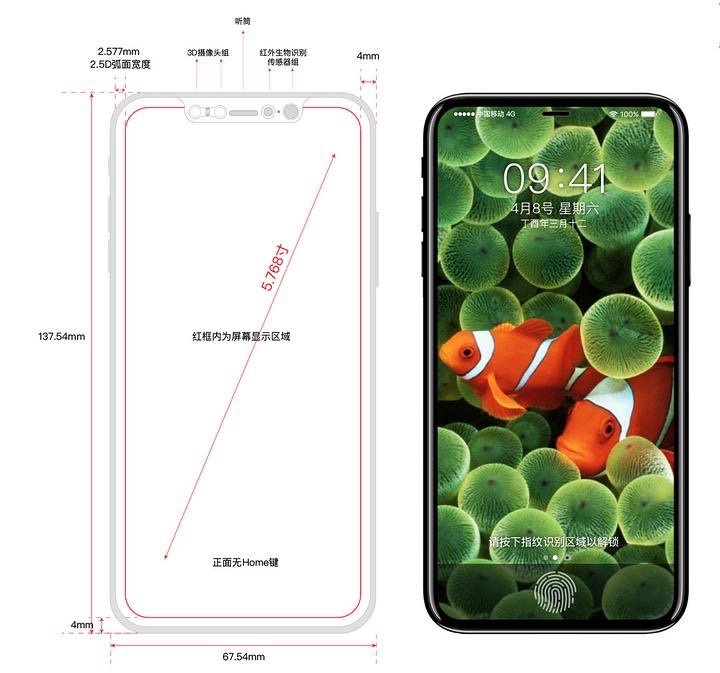 According to the diagram, the iPhone 8's display measures 5.768 inches on the diagonal and will indeed cover nearly the entire front of the device. There appears to be only a 4 mm bezel around all four sides of the display, with over half of that being the 2.5D curved glass at the edges and the remainder appearing to be the device's frame around the sides. The drawing shows a narrow earpiece at the top of the device's front, with various cameras, sensors, and other components on either side of the earpiece. Those components would likely include a front-facing camera, small microphone hole, ambient light sensor, proximity sensor, and the rumored 3D sensor. All of these components appear to be embedded within the display area itself, and while the accompanying rendered mockups based on the drawing show the earpiece appearing as a physical slit within the display area, the camera and other sensors are not depicted and it is unclear how they would appear in reality. With the display filling the entire front of the device, there is no dedicated Home button and thus no visible Touch ID sensor. Apple has been rumored to be trying to build Touch ID into the iPhone's display, but the company has reportedly been struggling with perfecting the technology and thus could resort to putting the sensor on the rear of the device. One of the renderings shows the rear of the device with no obvious dedicated Touch ID sensor, although there is no corresponding dimensional drawing of the rear. Notably, the rendering of the rear of the alleged iPhone 8 again shows a vertical dual camera, this time with the LED flash placed between the two cameras. As Ben Bajarin points out, the increased separation of the two lenses would help with augmented reality and 3D features, allowing for a greater difference in perspective. iDrop News and Benjamin Geskin posted their own mockups showing a very similar design a few days ago, but it is unclear whether the two batches of renderings are based on the same original source information or if one set's creator was working from the other. It is still early in the rumor cycle for detailed design leaks, so readers should continue to take information like this with a grain of salt until the information begin to solidify around a single specific design, but given KK's history of leaks this one is worth considering as a possibility. Update: The drawing and renderings shared by KK appear to have originated on ifanr, and Geskin has confirmed his renderings are based on the same drawing. Let's hope they perfect the Touch ID sensor under the display. Much nicer looking than the Samsung copy of yesterday. I really don't think Apple will consider moving the Touch ID to the back. This mockup seems like something they would consider. Most photos are taken in landscape mode, not portrait. Seems reasonable to rotate them. I truly don't see Apple putting the touch ID on the back . I am actually quite surprised how quickly people forget what Apple is really known for. Known for taking it's "forever" time to try and arguably perfect something before giving it to costumers. And just like they have on the past, they would take their time to make the on screen touch ID work. One thing they will not do is, place it temporarily on the back to have it removed again the following year and put it on the screen. That is more Samsung like kind of strategy. do you REALLY want less space in the status bar? Those are ugly mockups. Hope Apple has something way nicer planned. The new Samsung looks nicer imho than this. This is nice.... Wonder how close to reality this turns out to be. An iPhone7+ sized screen in an iPhone7 size shell, really nice! 1. I don't understand the obsession with bevel free designs. Unless you have a suction cup for a hand that can grip the back, your fingers need something to hold on to that won't be an issue if its partly obstructed, SOME amount of bezel is a good thing. 2. No bezel means NO CASE THAT CAN WRAP AROUND, this is also a terrible design idea because it means dropping the phone is more dangerous. 3. Non-square screens like this are a TERRIBLE IDEA. They are a *PITA* to program for and place all sorts of odd constraints on what can effectively be displayed there. Even worse? Having a freaking HOLE in the middle of the screen for the speaker and front facing camera parts. Expanding the screen/reducing the bezel is one thing, but its clear the people putting together these mock-ups haven't thought through the engineering and usage constraints. I'm also not sure why eliminating the physical home button is seen as ideal, unless they can incorporate the touch sensor into the screen its going to mean awkwardly sticking the sensor on the back of the phone (ala Samsung). Not to mention you'll have to dedicate that part of the screen to the home button anyway, so you might as well leave it there. Again, there are a LOT of engineering and useability reasons to stick with a physical hardware button (even if its no longer a mechanical switch one, ala the iPhone 7, MacBook Pro trackpad. I think the purpose of the vertical camera to to finally end the disease known as VVS (Vertical Video Syndrome). My guess is that in addition to rotating the pair of lenses, the lens itself is also rotated 90 degrees. Practically all regular users take videos in Portrait mode which is just a bad, bad idea. When you move the video to your TV it looks like a joke. That's why all first person video news reports look so silly and the networks have to add that moving background. If the camera is landscape when you hold your phone in portrait mode, you solved that problem. The UI will need to indicate that but it shouldn't be too hard. Video will be shown in landscape but smaller during recording. People who used to shoot in landscape will be able to accommodate (It is definitely easier to hold the phone in portrait mode while filming).